You're a small but growing company and you want to expand without spreading yourself too thinly. Oh, and some steady income would be nice, too. The solution could be to sell franchises in your company. Housework has always been an unpopular but essential part of domestic life, but more and more of us are choosing to pay other people to do the cleaning in our own homes. The business of modern life means that we seem to have less time for the Hoovering and dusting, and so companies that provide these services are cleaning up. Freddie and Ruth Rayner are a husband and wife team running Time For You, a home-cleaning firm based in Northampton. Their business was born out of near-tragedy when, four years ago, Ruth, a secretary, suffered a heart attack and almost died. But she recovered and the couple set about building up their own cleaning agency. With an initial investment of just £20 each, they were keen to grow the firm but without too much strain, for Ruth's sake. There was so much work for them they looked to expand, but rather than simply employ more people, in April 2002 they decided to offer the company as a franchise. They now employ more than 100 cleaners in their own area of Milton Keynes, and have 300 clients. The company has also given birth to 60 franchises, each with an average of 100 clients, and the firm is now turning over £500,000. "We're looking for people with enthusiasm," says Freddie. "It's not a get-rich-quick scheme; you can get rich slowly of course but really we're looking for those who want to succeed." Ruth and Freddie effectively sell people the rights to use Time for You branding and support, while at the same time operating as a separate business in a certain part of the country. It makes sense because their firm grows in size, but the responsibility for each agency is taken on by the respective franchisees. Franchisees are asked to apply, and then invited for two rounds of interviews. Once a prospective franchisee is approved, they're charged an upfront payment of £8,250, and a £200 a month management fee. In return the franchisee gets a start-up package including training, branded shirts and leaflets, insurance, a freephone number and, of course, the right to keep any profits. Judith-Anne Smith is one of their franchisees; she owns a Time for You franchise in Billericay, Essex. Although she signed up only 12 months ago, business is already booming. "I've grown to over 180 clients and 120 cleaning ladies," she says. Ruth and Freddie try to stay in constant touch with their franchisees, and hold regular meetings with them back in Northampton. But does this give them enough control over their widely-spread network of businesses? "The franchisees are entrepreneurs in their own right," says Freddie. "They have their own ideas about how they want to run things so of course we lose some control in that regard, but I'm happy with that." Time for You is now selling franchises at a rate of one a week, and expansion abroad is the next plan. Franchising isn't suitable for every company but for Ruth and Freddie so far it's been a clean route to success. Ruth and Freddie Rayner run a franchise business called Time for You. The idea of a cleaning lady appeals to us all. If you are expected to clean your bedroom, wouldn't you like a cleaning lady - or perhaps a cleaning man? Ruth and Freddie found that lots of people thought the same way. The original business they set up in Milton Keynes grew rapidly. They soon had 300 clients and 120 cleaners. They realised that they had a business that others could run on the same lines - just what you need for a franchise. Time for You is a simple business which makes it right for a franchise. Ruth and Freddie's original business involved advertising for clients who wanted their houses cleaned, finding a cleaner to match and keeping an eye on quality. They then had to manage all the paper work involved. In return they buy the franchise. This covers the services and the use of the name. Many people buy franchises in famous name businesses because the name gives them instant recognition. Ruth and Freddie can run a much bigger business as franchises than they could if they'd kept direct control over everything themselves. They also earn a steady income from selling the franchise. The price has to be set carefully. It must reward them for their work and risk but not be too high to attract potential franchisees. It's all a question of demand and supply! What sort of paperwork would Ruth and Freddie have to do? What sort of problems might crop up if they tried to run a national cleaning business themselves? What sort of factors would determine the price set for the franchise. For the business to succeed, Ruth and Freddie need to attract people to run a local Time for You. This spreads the service across the country. There are currently 55 people, often couples, running the franchises. They fill in a form which asks for a range if information about themselves. The form is an introduction and provides Ruth and Freddie with some background to people who are considering start up a Time for you franchise. Have a look at the form and explain why Ruth and Freddie want this information. What else would they want to know about people before they agreed to take them on as franchisees? How would you set about finding out? What sort of characteristics would you be looking for? What is a franchisee looking for? Many people think it's a good idea to run a business but haven't quite got the courage to set up on their own. A franchise is a good solution as it provides access to a business idea that is already working and the backup and experience of people who have already made it work. People are also looking for a reasonable income from their work so they will want to see the likely return on the business. 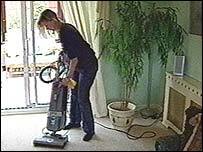 Ruth and Freddie suggests that a business with 300 houses to clean might have a gross profit of £100,000. What sort of costs will a franchisee have to pay? Where does their revenue come from? What costs should be deducted from gross profits to find out what net profit will be? Ruth and Freddie are keen for their business to grow. They have set up a commercial business which offers cleaning services to offices and shops. A successful Time for You franchisee will be offered a commercial franchise free after two years. Ruth and Freddie could sell the franchises in the commercial operation. Why do you think they are offering them to people who have been running Time for you for two years?